Hero MotoCorp (formerly Hero Honda) has been testing its dirt bike for India on Indian roads. Two such test mules were spotted on road testing under heavy camouflage. The visor, fuel tank, seats etc. were all covered under some cloth and tapes and the only parts visible in these spy pictures is the front wheel with a large telescopic suspension, a high mounted front mud-guard, front disk brake, rear drum brake, rectangular section swing arm. It also has an air cooled single cylinder 4 stroke engine, high mounted rear mud guard, high mounted single exhaust muffler mounted on the right side. It also had a large profile rear wheel and a sleek front wheel. Bringing a dirt bike to Indian two wheeler market will create a new segment of two wheelers in India which is expected to be popular with Indian youth as they are always looking for something exciting and sporty. Its all up to the pricing of the Hero MotoCorp dirt bike in India which will largely decide its fate in India. 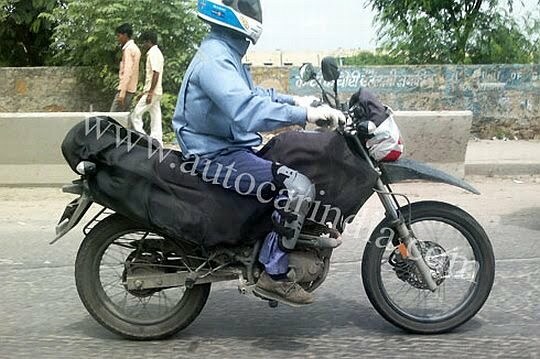 We are looking forwards to the launch if this dirt bike in India. We will keep you posted on the latest developments on this bike, you can stay updated by liking our Facebook Page or by signing up for our free email newsletter.